According to the CDC, tooth decay and cavities affects over 90% of American adults. Another 50% have signs of gum disease. Apart from brushing and flossing regularly, some vitamins and minerals can aid in dental health. Here are some of the major ones recommended for dental health. Calcium is a major component of teeth. Your teeth and jaw are made of this element. Teeth are essentially bones, and calcium helps maintain their strength and structure. The amount of Calcium your body needs depends on your age and gender. The recommended daily dose for 19- 50-year-olds is 1,000 mg. For women between 51-70 years, the daily recommended dose is 1,200mg. Dairy products are the most recognized sources of calcium, however almonds, leafy greens and beans contain calcium as well. When your body gets low on calcium, it pulls some from your bones and your teeth, where your body’s calcium reserves are. This can in turn negatively affect your dental health by causing weak roots, irritated gums, and tooth decay. Vitamin C’s role in your body is to keep connective tissues in your gums strong. Without Vitamin C, the tissues holding teeth securely will weaken, causing your teeth to become loose. Low Vitamin C can cause bleeding gums and gum disease as well. Sweet potatoes, peppers, oranges, limes, and berries are rich sources Vitamin C.
If you spot blood when brushing your teeth, be sure to book an appointment with a dentist for a professional assessment of the problem. This vitamin is essential because it helps with the absorption and deposit of calcium. You can get this vitamin from the sun, as well as dairy and cereal products that are fortified with it. Vitamin A is key not only in building enamel but also in keeping your gums healthy. Most orange-coloured foods have vitamin A: carrots, cantaloupe, sweet potatoes and so on. Vitamin A keeps the saliva in your mouth flowing. This saliva is instrumental in cleaning away food particles and destructive bacteria from teeth and gums. In turn, this makes your teeth less susceptible to disease. This element plays a crucial role in dental health because it aids, builds and protects tooth enamel. Protein-rich foods provide the best sources of phosphorous. These include meats, fish, poultry and eggs. Fluoride has been included in most toothpaste because of its ability to fight tooth decay. It’s also a common compound in tap water, seafood, and black tea. Similarly, Zinc can fight tooth decay by eliminating bacteria and plaque. This trace mineral is found in saliva and goes over the surface of your teeth, effectively removing debris. Cashew nuts, red meat, mushrooms, legumes, and pumpkin seeds are rich in Zinc. By paying attention to your nutrition, you can ensure that these foods are included regularly in your diet. This coupled with regular brushing and flossing should ensure you have strong, healthy teeth and fewer trips to the dentist. 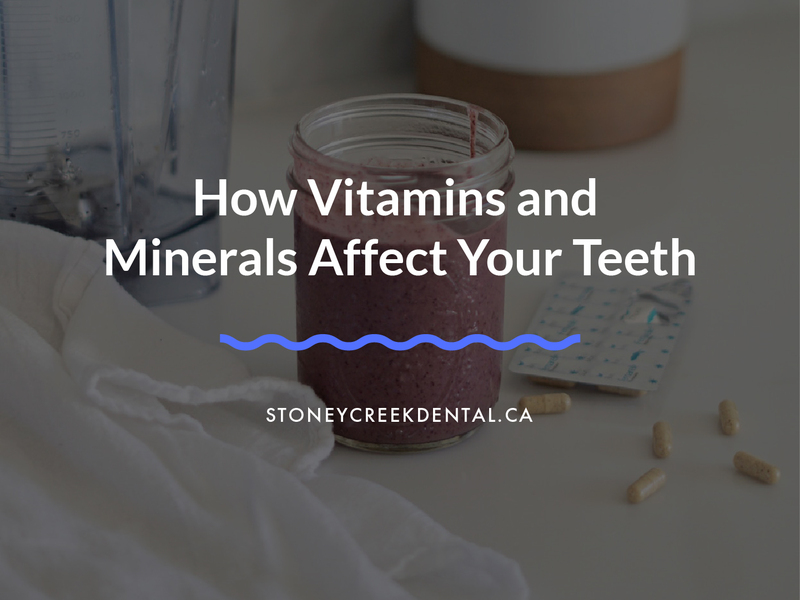 However, if you are uncertain on whether or not you are getting enough vitamins and minerals, your Fort McMurray dentist at Stoneycreek Village Dental can be able to evaluate this with you and possibly recommend supplements as well as address any dental issues you might have.